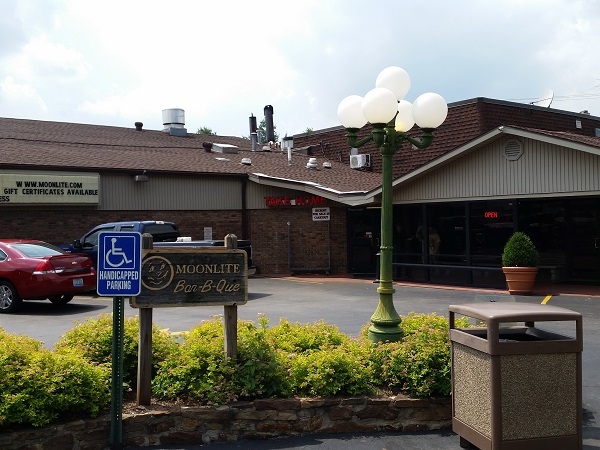 Moonlite Bar-B-Que Inn, Owensboro KY – Marie, Let's Eat! 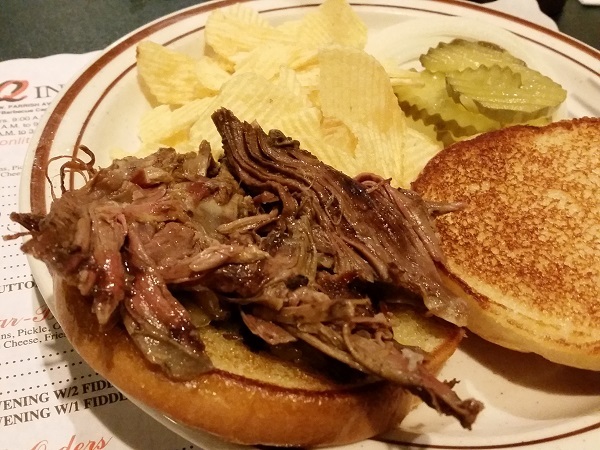 Five years ago, we visited the city of Owensboro for the first time, and tried smoked mutton at Old Hickory, one of the city’s two best-known, and big, barbecue joints. I remember really enjoying it, although the years, and all the barbecue that I’ve eaten since, have dulled the specifics of my memory. As we expanded our experience of different techniques and preparation styles, I thought more about how Old Hickory served their chopped mutton drowned in the “dip,” a thin and black Worcestershire-heavy brew, and wondered whether, the next time I found myself in Owensboro, I could try the meat dry, or whether cooking in the sauce was standard for western Kentucky, as it is – in very, very different sauces, of course – across middle Georgia. Sipping on the cinnamon milkshake I’d picked up at Walls’ Drive-In, I moseyed west on US-60 until it met US-231 near the town of Maceo. I allowed myself a detour and drove north across the William Natcher Bridge, which is incredibly gorgeous, back into Indiana, then turned around and came back. I love big beautiful bridges so much, and there are so many of them up here, that I honestly wouldn’t object to a road trip just zig-zagging back and forth across the river, from Pittsburgh to the Mississippi. I made it to Moonlite, probably the largest and most celebrated of Owensboro’s many barbecue restaurants, around 1.45. The place is simply enormous, with room for dozens and dozens in a parking lot so big that you’ll look around for the shuttle bus. It’s on one of the major thoroughfares, W. Parrish Avenue, next door to an old dairy bar called Big Dipper. If I weren’t pressed for time and budget, I’d have liked to stop there as well! One of the Moonlite’s many, many employees seated me, and another asked whether I wanted the buffet. Well, not this trip, but it sounds like a really great meal can be had from it. The Moonlite originally opened in 1947 but has been in the Bosley family’s hands since they purchased it in 1963, and they’ve steered it into the most popular barbecue restaurant in the whole state, with a fleet of catering vans and billboards throughout the region to make certain that this is the first choice of any tourists heading to Owensboro. They’re most known for mutton, but they also smoke pork, beef, and chicken. 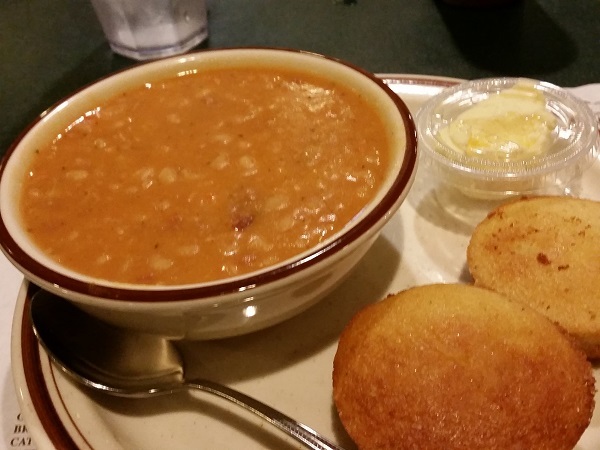 For sides, they offer most of the same things you’ll see at most barbecue places in Tennessee, but they also offer burgoo and bean soup. I had burgoo at Old Hickory and a couple of places in Louisville before we blogged and it’s close enough to Georgia Brunswick stew that I passed on it in favor of the bean soup, which you don’t see all that often anywhere. It was okay, but should the road bring me back to the Moonlite, I’ll have the burgoo. In order to sample the mutton dry, you need to order it sliced. As I suspected, it has a very strong and gamy flavor, and I honestly did not enjoy the taste as much as I remember enjoying the chopped mutton at Old Hickory, and I didn’t taste any smoke flavor in it at all. I tried a couple of bites with a little bit of the dip and didn’t think much more of it. I tried the next few bites with a good soaking of the Very Hot Sauce on the table and enjoyed that a little bit more. Finally, I drowned about the remaining third of the mutton in dip, let it soak up while I had a few more spoonfuls of bean soup, and enjoyed that a heck of a lot more. My hypothesis is that mutton really does need a very good dose of dip. Drenched, it was quite good, but dry, it was my mom’s pot roast. Now having said that, and risked the ire of Owensboro’s mutton faithful, I have to ask… where the heck are the Kentucky barbecue bloggers? Owensboro talks a big game about being the barbecue capital of the world, but the reason people like me have only ever heard of Moonlite Inn and Old Hickory is simple: the only people who write about barbecue in Kentucky are people from Texas and Georgia, or Garden & Gun and Southern Living, spending a single day in town, and none of us make it that way very often. I’m tempted to give western Kentucky a much longer look in the near future and, if so, I will do a little better to dig in – I hear tell that Peak Brothers BBQ in Waverly is something special – but really, somebody local needs to get a WordPress blog and preach. I’ll listen! Posted on July 15, 2015 August 22, 2017 by Grant G.Posted in barbecue, kentucky, roadfoodTagged barbecue, kentucky, mutton, owensboro, roadfood.com. Ok, Grant- I’m hooked! Mention barbecue and I’m all ears. Love your blog and will need to take notes on what you’ve sampled and enjoyed! Thanks! We hope to hit 350 barbecue places before the end of the year, including a few more in Kentucky! Good to read about the mutton. I’ll smoke almost anything, but I haven’t tried lamb because it just sounds wrong. I’ll make sure to sauce it when I finally do so barbecue it. Thanks for writing, Brooke! We’re planning to be back in that area in November and hope to sample the mutton at two more restaurants, at least. I’m looking forward to learning more about the flavors and preparation styles. There is much better bbq in Owensboro, especially Mutton. This place is a rip off, and are rude people. We certainly plan to visit some more barbecue places in the region – possibly three – later this year to sample more mutton. But the prices at Moonlite are perfectly reasonable to my eye, and the three staff members with whom I interacted were all very polite to me. Thank you for writing all the same! Can’t say I’ve ever had a bad experience at the Moonlite. Prices are reasonable and my experience with the service has always been pleasant. That said, I’ve never had a great experience there, either. It’s one of those places that punches below its weight. It’s good, no doubt, but its reputation suggests it ought to be better. I’m partial to Starnes’ BBQ in Paducah, which probably would qualify as the other of the “Dynamic Duo” of Kentucky BBQ. No mutton there, though. Your choices are pork, ham, or turkey. The sauce has considerably more kick to it than the sauce at the Moonlite (which I think probably could do double duty as a desert topping).